When PC World shopped online for a 42-inch Panasonic plasma television in early November, we found a number of tempting offers. But the "Smart Choice" buy, according to comparison shopping engine Shopzilla.com, was from Brooklyn, New York-based Butterfly Photo. The "Smart Choice" seal is supposed to indicate that buying from the company will be "worry-free" and that the merchant has a "proven track record of dependability and customer satisfaction." But the New York Better Business Bureau paints a different picture of Butterfly Photo: It gives the retailer an "unsatisfactory" rating, saying (at this writing) that some 61 complaints had been filed against it, and that the retailer had failed to resolve the underlying issues responsible for the pattern of complaints the bureau had received. Brian Smith, an analyst for market research firm Comparison Engines, says shopping engines rely on imperfect rating systems that are in need of an overhaul. "At the end of the day, it's buyer beware," Smith says. Our investigation showed that leading shopping engines, including Shopzilla.com, Shopping.com, PriceGrabber.com, and Yahoo Shopping, frequently award accolades to companies with spotty records. Nearly a third of the merchants that came up in our searches for popular consumer electronics on Yahoo Shopping, for example, had "unsatisfactory" ratings with the BBB. What's the source of the problem? Shopping engines depend on customer ratings to make these recommendations--and ratings and reviews can be faked by interested parties. That isn't a new phenomenon, but unfortunately, we found evidence that some shopping engines--despite their claims to the contrary--are still being manipulated to get customers to visit certain online stores. 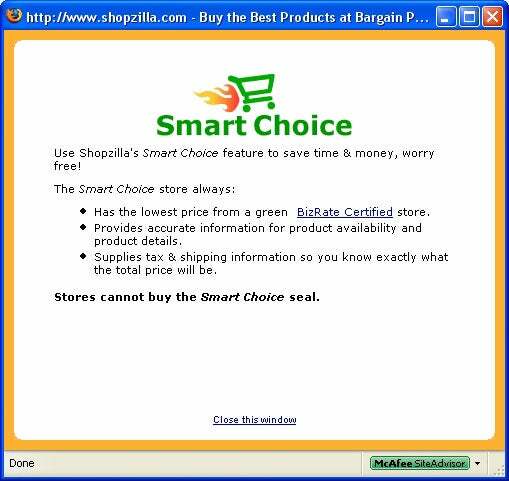 Shopzilla's "Smart Choice" seal and the site's explanation of what it means. When we asked Shopzilla how a company with an unsatisfactory BBB rating could earn its "Smart Choice" seal, Shopzilla spokesperson Helen Malani said, "Ratings and reviews are just one component in the shopper's decision-making process." She wouldn't say whether recommending Butterfly Photo, in retrospect, was a mistake. Shopzilla, however, wasn't the only engine recommending Butterfly Photo. When we searched on Shopping.com for a Samsung 32-inch television, Butterfly Photo's offering again earned special attention, showing up in the search results as a "Smart Buy." The "Smart Buy" seal, according to Shopping.com, indicates that the search result is the lowest available price from a "Trusted Store." Shopping.com's sibling sites, Dealtime.com and Pricetool.com, also displayed Butterfly Photo's price with the Trusted Store logo. NexTag.com and its sibling site, Calibex.com, show "Trusted Seller" logos that indicate Butterfly Photo has received positive customer ratings, displays accurate prices, and "address[es] customer service complaints quickly and fairly." Merchants cannot purchase these automatically generated "certified," "smart," or "trusted" logos. PriceGrabber (with whom PC World partners with to display shopping information on the PCWorld.com site) and its sibling site, BottomDollar.com, do not display such logos. NexTag cofounder Rafael Ortiz says, "Our ratings are a function of reviews written by shoppers on our site and not on local BBB (ratings)." Regardless, he says NexTag is further investigating store reviews that PC World brought to its attention. When we asked Rob Goldman, vice president of Shopping.com's U.S. business unit, how a company with such a negative BBB rating could be listed on the engine's site, he declined to comment. However, since we began our investigation, Butterfly Photo has been suspended from Shopping.com. Butterfly Photo Chief Operating Officer Eli Sakkal said he had attempted to contact the BBB to resolve all complaints on file, but that he had had trouble reaching the right people at the agency. "There is no way we make 100 percent of the people 100 percent happy all of the time," Sakkal says. Regardless of your budget, get the most computer for your buck. 'Tis the season for online scams, spam, and malware attacks. Here's what you need to know.